Have your paycheck automatically deposited into your Capitol View account with direct deposit. We can even setup automatic disbursements so that specific amounts of your paycheck automatically deposit into multiple accounts (ie. savings, money markets, club accounts, etc). State employees have a special form to complete for state payroll which you can contact us for. Non-state employees can download our direct deposit form, here. Commitment issues? Payroll deduction is right for you! With payroll deduction, you can automatically deduct a portion of each state paycheck and have it deposited to your Capitol View account. Contact us for a payroll deduction form to get started. *Payroll deduction is only available to state employees. Central payroll only permits payroll deduction to one institution, so consider this before switching your accounts. Capitol View offers the perfect gift solution for any occasion, ATIRA Gift Cards. They are easy to use, affordable, and allow the recipient to get exactly what they want. They are more then just a great gift though! You can also use them online and on trips as a secure form of payment that is not affiliated with your Capitol View accounts. Protect yourself against fraud with ATIRA Gift Cards. 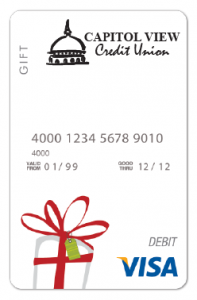 Available for only $3, ATIRA Gift Cards can be loaded with up to $750 and can be used anywhere that Visa™ is accepted. Visit Capitol View to purchase an ATIRA Gift Card today! The fastest way available to send/receive money is through a wire transfer. However, wires are more expensive than other options. View our rate & fee schedule for current wire fees, here. To send wires from your Capitol View account to another institution, simply contact the receiving institution and request their wiring instructions. Contact Capitol View with those instructions and we will prepare an authorization form for you to sign. Our daily wire cutoff for outgoing wires is 11am. Most wires are received by the receiving institution within a few hours. *International wires will require the receiving country’s swift code. Placing a stop payment on checks can be done two ways, verbally and with written authorization. Verbal stop payments (stop payments authorized without a written signature) expire after 14 days. Written stop payments expire after 6 months, however can be extended as needed. You can place an immediate stop payment on an item using Home Banking (however this will expire after 14 days unless a written signature is provided). Otherwise, you can contact Capitol View for a stop payment form. Members can also place a stop payment on electronic transactions (ACH). Contact Capitol View for a form for ACH stop payments. For additional information regarding disputes and fraud, click here. *View our rate & fee schedule for current fees associated with stop payments, here. No one ever intends to overdraw their account, however mistakes do happen. Luckily, Capitol View has multiple ways to safeguard your bills and accounts from just such a situation. Avoid the surprise of overdrafts by setting up customizable account alerts within home banking. Account alerts are easy to setup and can be setup to notify you by email or text. Learn more about account alerts, here. Be sure to designate one of your accounts to backup your checking in the event of going overdrawn. For example, if a check tries to post to you checking, but it will make the account overdrawn, members can assign their savings account to automatically transfer funds to cover the check. Complete a new Overdraft Protection form to specify your preference or any changes. Three automatic transfers are free each month. View our rate & fee schedule, here. Members with direct deposit may qualify for privilege pay, a service that allows overdrafts to a certain level. Contact Capitol View to find out if you are eligible for privilege pay. Overdraft fees may apply. View our rate & fee schedule, here. If you have a Capitol View MasterCard you can enroll to have a cash advance made to prevent your account from becoming overdrawn. Cash advance fees may apply. View our MasterCard page for credit card terms & conditions, here. To enroll in MasterCard Overdraft Protection, complete our Overdraft Protection form. Members have the ability to opt-in for debit card overdrafts. By opting-in, debit card transactions that will make their account overdrawn will be authorized, allowing the account to become overdrawn. Overdraft fees may apply. Members who opt-out will have debit card transactions declined if they will make their account overdrawn. Complete our opt-in/out form to specify your preference, here. *Important note: Capitol View reserves the right to return any item which will make an account overdrawn, at the credit union’s discretion, based on history or abuse. Accounts overdrawn for more than 30 days may be subject to closure.